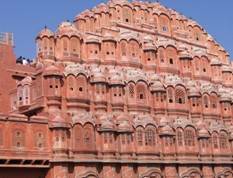 Jaipur is the capital of Rajasthan and in 1876 A.D.Jaipur dressed itself in pink to welcome Prince Albert, consort of Queen Victoria and earned the epitah "Pink City”. 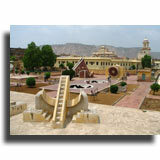 It is also a home of excellent handicrafts and is especially known for the exquisite gold jewellery enameled or inlaind with precious stones, blue pottery, carving on wood, stone and ivory, block print, tie & dye textiles, hand made paper, miniature painting etc.Jaipur is known for its fairs and festivals. Jaipur located in the northern part of the country is seperated from the Thar deserts by the Aravalli hills and is at a distance of about 258kms from Delhi. Geographically it is located at 26.92°N 75.82°E. The Pink City has been the capital erstwhile Jaipur state since its inception in 1727A.D.It gets the name from its founder Prince Maharaja Sawai Jai Singh II.He was not only a great ruler, but also a renowned mathematician and astrologer.Vidhyadhar Bhattacharaya, the chief architect and town planner of Jaipur, designed the cityas per the Hindu treatise, Shilp Shastra.The city was laid with great precision and could also be called as the first planned city of the country. Kite Festival - This festival coincides with Makara Sankranthi on January 14th.On this occasion the sky is filled with multi coloured kites. All age people fly kites and take on bids to cut each others kite string. This occasion displays Gujarat cuisine, folk art and handicraft very lavishly. This festival is celebrated to the mark the end of winter. Ganguar - This festival falls in the month of March to worship Lord Shiva and Parvathi.Women wear traditional Lehanga-choli and take part in dance. The procession to Pichola Lake is the highlight of the Gangaur festival in Udaipur. The ceremony attracts a number of tourists and locals. The whole event comes to an end with the display of wonderful fireworks on the bank of Pichola Lake. Teej - This is one of the important festivals of Jaipur which heralds the advent of monsoon. Ladies enjoy swings while singing traditional teej songs. Rope swings are decorated. Women wear exotic colourful dresses. Idol of Goddess Parvathi is also worshipped. Married women’s give a plateful of sweets and fruits to their mother in laws, which are called Vaina. Pushkar mela - This is annually held at Pushkar.Major attractions are the camel races and cattle fair.It is a major tourist attraction. This is celebrated in the month of October-November. 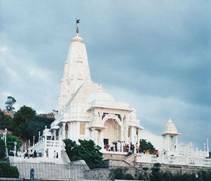 It is situated just below the Moti Doongri, known for the intricate marble carvings in white marble, popularly known as Lakshmi Narayan temple. The temple houses the idols of Vishnu called Narayan and his consort Lakshmi, Goddess of wealth and good fortune. This shrine of Lord Krishna is situated amidst of Jai Niwas garden. The idol of the presiding deity is taken out seven times everyday for 'Aarties' and 'Bhogs' is mostly offered in the silver wares, containing mostly of sweets. This temple was built by Shri Kankawatiji, Maharani of Maharaja Man Singh I, displayng the Nagar style architecture. The Temple houses the idol of Lord Krishna and is famous with the celebrated saint-poetess Mira Bai. This temple is known for its Scottish type castle and is situated close to Birla Lakshmi temple. It houses the idol of Lord Ganesha and is frequently visited by lot of devotees. This was built in 1799, by Maharaja Sawai Pratap Singh, is the most recognizable monument of Jaipur. The 5-storied stunning semi octagonal monument having 365 windows with over hanging latticed balconies is a fine peice of Rajput architecture. This observatory hall was built in 18th century by Maharaja Sawai Jai Singh II. Enormous sundial still provides accurate time, which is subject to daily corrections. 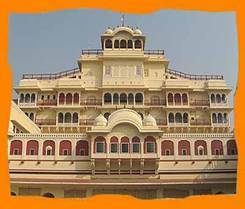 The city palace is situated in the heart of the old cityis a blend of Rajput and Mughal architecture. The palace is known for its ornate entrance gates, arches, projecting balconies and a series of courtyards. It houses a seven storied Chandra Mahal in the center, which affords a fine view of the gardens and the city. Diwan-e-Awam, has intricate and collections of manuscripts. This place is located at a distance of about 11kms from the city and it was the former capital of the state. The fort s remarkable as much for the majestic grandeur of its surroundings as for its sturdy battlements and beautiful palaces. It is fine blend of Hindu and Muslim architecture. The Palace complex is lavishly ornamented and displays the riches of the Amber. 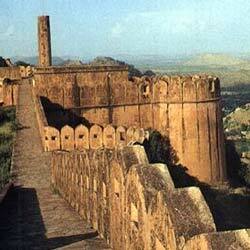 Jaigarh fort standing on a hilltop overlooks the palaces and the city of Amber. The worlds biggest cannon on wheels, the Jai Ban is positioned here and it was built during reign of Maharaja Sawai Jai Singh. It has twenty feet long barrel.100kgs of gun powder has to be pumped in the canon for a single shot. this Tiger Fort atop a hill approachable by a four-wheel drive road. 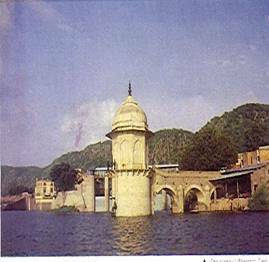 It was built in 1734 by Sawai Jai Singh and was later enlarged by Sawai Ram Singh II in 1868. 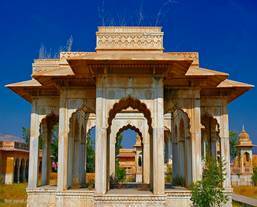 This is the funeral place for the royal ladies marked by some wonderfully carved cenotaphs on the way to Jaipur Amber. Rajasthan State martyrs memorial Jaipur is situates at Janpath, near Vidhan Sabha Bhawan.A tribute to the martyrs of Rajasthan who have died fighting for the country. 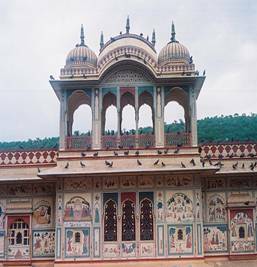 This is situated at about 11kms from Jaipur in Sanganer, the renowned block printing centre. 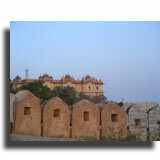 It also has historical ruins and Jain temples. This bagh is at a distance of about 10kms away from the city and is situated on the Jaipur-Agra road. The terraced gardens and the palace are decorated with bright murals depicting hunting scenes. This was built by Maharaja Swai Jai Singh II in 1710 for his queen. This is locted on the way to Agra, built by Vidhyadar Bhattacharya. This beautiful terraced garden has several galleries and pavilions decorated with exquisite murals, depicting Lord Krishna. This is situated on the way to Amber and has a newly restored temple and garden near Jal Mahal.This is a famous picnic sport. This museum houses a collection of beautiful dolls from all over the world. It is situated inside Seth Anand Lal Poddar Deaf & Dumb School on Jawaharlal Nehru Margh. The two storey central museum amidst the Ram Nivas garden is an impressive building. 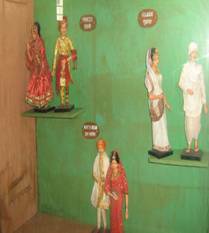 It has an excellent collection of brassware, ivory carvings, jewellery, textiles, pottery, sculptures, miniature paintings, costumes and clay models depicting the scenes of rural Rajasthan. It offers unique audio-visual education about stars and entertainment with its modern computerized projection system. This 16kms perimetered lake, created stemming the river Banganga to supply water to Jaipur is a quite place with boating facilities. Ranthambore is about 145 kms away from Jaipur.The most exciting feature of the sanctuary is the safari in the jungles. The place is famous mainly for diurnal tigers that roam freely in the woodlands. These biggest of the families of cats are easily spotted in the daytime. 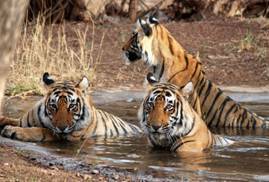 Other attractions of Ranthambore Park include animal species like leopards, bears, bucks, pythons, crocodiles and many other small species. It is located at a distance of about 107kms from Jaipur.Sariska National Park used to be the hunting grounds to the Royal family of Alwar. Sariska Park homes 'Indian Tigers', hyena, wild dogs, gazelles and more. Safaris provided by private agencies are the best things in menu for craving wildlife enthusiasts. Sariska National Park has numerous species of wild animals. 2.Bapu Bazar - Ironware and Utensils How To Reach This Bazaar? 4.Johari Bazar textiles - Jewellery and tie and dye textiles. How To Reach This Bazaar? 6.Sanganer Town Paper - Block printing and hand made paper. 7.Maniharon ka Rasta - Lac bangles and Lac items. The Jaipur Airport also known as Sanganer Airport is well connected with all the major cities of India like Delhi,Mumbai,Kolkata,Chennai.There are direct flights to Delhi, Mumbai , Jodhpur, Udaipur, and Ahmedabad. Jaipur is directly connected to most of the cities in India by trains. Apart from the fastest train Shatabdi Express, many mail and express trains that connect Jaipur to Delhi such as the Pink City Express, Chetak Express. If you have a penchant for luxury, you can undertake a royal journey with the Palace on Wheels, which leaves Delhi every Saturday. Jaipur has good Road Network of Jaipur connecting it to all parts of India. There are national highways NH8 AND NH11 passing through Jaipur. It takes five hours to reach Jaipur from Delhi. Presence of good bus services from Delhi, Agra and other important north Indian cities to Jaipur has made the city a convenient tourist destination.